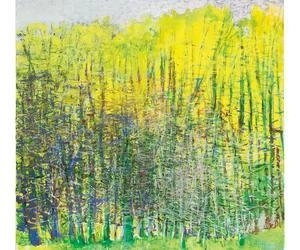 Hamptons Art Hub, "NYC Gallery Scene Highlights"
Ameringer | McEnery | Yohe will present “Wolf Kahn,” an exhibition of recent paintings celebrating the artist’s 90th birthday. Wolf Kahn, who studied under renowned Abstract Expressionist artist Hans Hofmann, will show work made during the past two years that continue his exploration of color. The landscapes, which are simultaneously descriptive and abstract, depict the changing of the seasons with quick, flickering brushstrokes and delineated bands of vivid hues. Kahn, whose work blends realism and the formal discipline of Color Field painting, embodies in his paintings the fusion of color, spontaneity and representation.